The "Seven Summits" of mountaineering are the tallest peaks on each continent. Because mountaineers cannot agree on whether to include the highest peak in Australia and Oceania as on the Australian mainland or the continent's island groups, the "Seven Summits" often includes eight mountains! 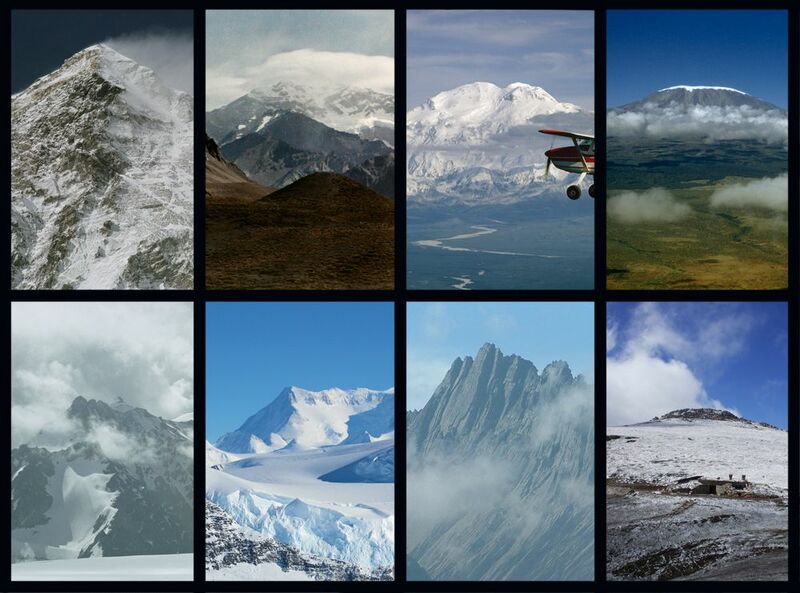 From top left, in descending order of elevation: Mount Everest, Nepal and China (Asia); Aconagua, Argentina (South America); Denali, United States (North America); Kilimanjaro, Tanzania (Africa); Mount Elbrus, Russia (Europe); Mount Vinson, Antarctica; Puncak Jaya, Indonesia (Australia and Oceania); and Mount Kosciuszko, Australia. The Seven Summits are: Mount Everest, Nepal and China (Asia); Aconcagua, Argentina (South America); Denali, United States (North America); Kilimanjaro, Tanzania (Africa); Mount Elbrus, Russia (Europe); Vinson Massif, Antarctica; and Puncak Jaya, Indonesia (Australia and Oceania). Some mountaineers consider Mount Kosciuszko, Australia, the highest point in Australia and Oceania because it is located on the Australian mainland. Morrow was actually the first person to climb all eight peaks. Climbing the Seven Summits—or, really, the “Eight Summits,” if Kosciuszko is included—is a major mountaineering achievement. Fewer than 120 people have completed the challenge. accomplishment or successful completion of a task.